Maybe it's the age I am. Or maybe it's the terrible injustice of the situation. But the gold-plated pensions that the elite in Irish society are still getting drives me crazy. And it's not just the elite. The very generous guaranteed pensions that everyone who is on the state payroll gets also makes me angry. Why? Because if you're a private sector worker like me -- a lifetime spent working in newspapers -- you probably have been paying into a pension fund. Your pension fund will have been invested mainly in blue chip companies in the stock market. And thanks to the collapse in stocks over the past few years, that fund will now be worth probably half what it was and your pension fund will be in deep trouble. The result is that most people like me who have private sector pensions have been hit. Most private sector companies here have closed down their so-called "defined benefit" schemes which guaranteed you a pension for life of about half your salary. They now offer "defined contribution" schemes in which the amount you put in is set, but the amount you get out in a pension depends completely on how the fund has performed on the stock market in the meantime. In my own case, the defined benefit group scheme I was part of is in such trouble that the supposedly "guaranteed" level of pension I should be getting has been cut. And there are many other private sector workers in Ireland who have been hit much harder than me -- mainly people who were self-employed and had their own individual pension funds. This sector includes all kinds of people from plumbers to plastic surgeons, and many of them would have put a lot of their private pension money into bank shares and other leading stock market companies. Indeed, I know a few of them who put everything into bank shares, because they believed the banks were a sure thing and would always make money. So there are an awful lot of people here who now know that the financial crisis Ireland is going through is not some kind of remote, abstract situation that affects someone else. It's not someone else -- it's them. It's personal. And for the older people among them who are coming up to retirement time it's deeply worrying, even scary. What was supposed to be a secure, comfortable old age now looks very uncertain. Contrast this situation with the case of Brian Goggin, the former CEO of the Bank of Ireland, who "retired" in 2009 at the age of just 57. In this context "retired" means he got out before he could be thrown out. In his last year in the job, Goggin got a staggering pay package of over €3 million. But the best bit was his pension -- an even more staggering €650,000 a year, guaranteed for life. And remember, he's still only 59! But of course he's worth it. This is the guy, after all, who ran the bank during the worst excesses of the boom, when billions were gambled by the banks on property. Bank of Ireland was not the worst of them, but like the rest of them it shoveled money at the developers as fast as it could. Goggin was the boss when it all started to go belly-up. 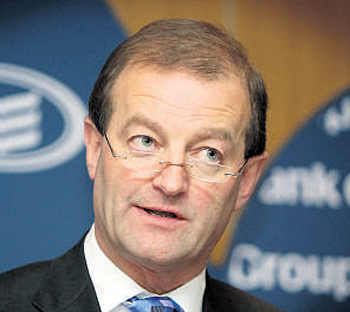 He was the boss in September 2008 when Bank of Ireland and Allied Irish Banks had to go cap in hand to the government and misled or lied their way into a state guarantee of all bank debt. It was that decision by the government that eventually led to the bailout and to us losing our economic sovereignty. Goggin, like the other bank bosses, was a main player in the destruction of the country. But instead of ending up in jail they're still enjoying the good life, thanks to their gold-plated pensions. And they will go on doing so even though the banks are now almost entirely owned by the state and their huge pensions have to be paid out of borrowed money. Goggin and the other bank bosses are not the only ones in this fortunate position, of course. There are many others in the private sector and semi-state elites who get telephone number pay and pension packages, even when their companies are struggling. And on the state payroll, the pensions for life given to politicians and senior civil servants are on a level that the rest of us mugs can only dream about as we pay the taxes to fund them. It doesn't stop there, of course. Almost everyone on the state payroll has a guaranteed pension for life paid for by the state. These state workers now have to pay a bit more in deductions to fund their pensions. But they still end up paying less than one third of what it would cost a private sector worker to fund a pension for life at the same level. So how is this possible? Where does the money come from? The trick is that the pension payments are paid out of current tax revenue or borrowing. They are not dependent of the performance of an investment fund. So it doesn't matter whether tax revenue is up or down or whether the country is bust and borrowing heavily. The pensions still have to be paid. And it's the same for some of the elite in the private sector. Their pensions have to be paid, no matter how their former companies are performing. This is completely unjust, of course. But it is something that the trade unions, which now have their main power base in the state sector workforce, are fighting to retain. So much for equality, brother. True equality would mean that the pensions of all state workers would be linked to the average performance of all the pension funds that private sector workers depend on and the pensions that those funds produce. With all the statistics we have access to these days and all the computer power we have to analyze the figures, such a calculation would be easy to make. Any suggestion of this type is met with a furious response from our trade union "brothers.” Trade unions leaders (most of whom are on guaranteed pensions) talk about a race to the bottom. State workers talk about the guaranteed pensions being a main reason they took state jobs in spite of the low pay. Reducing the pensions now would be unfair, they say. This might have been an argument years ago when civil service jobs were poorly paid in comparison with private sector jobs. But thanks to the national wage deals and the campaigns by union leaders, state sector workers are now paid far more than their private sector counterparts in the real economy and have been for a good few years now. So workers on the state payroll are winning both ways, both on pay and on pensions. No one seems to know what to do about this situation. The government here is afraid of the unions in the state sector and the chaos they could cause if they were to take mass action and there was a widespread withdrawal of state services in hospitals, schools, welfare offices, security and so on. Of course this is not a problem just in Ireland. Efforts by the Conservative government in Britain to contain the huge cost of public sector pensions there were met with a nationwide one-day closure of schools by teachers a week ago. More closures are threatened by the teachers if the government goes ahead with plans to make them work a bit longer and reduce their pensions slightly. It's the same in France, where state workers have been resisting attempts to get them to face financial reality over the past few years. And we all know about Greece, where a lot of state workers still think it's okay to retire on a guaranteed state pension in their early fifties even though the state in question is bust! What all these cases have in common is the view of the state as a bottomless pit of money from which state workers have an absolute right to continue to draw high pay and high guaranteed pensions for life no matter what is happening in the real economy. That mindset, which isolates state workers and elites in the private sector from the ups and downs of the real financial world, has to be changed in other countries and particularly in Ireland. It is essential here if we are to get a national consensus on the major cutbacks that lie ahead. One final point to round off the story of Goggin. The Sunday Independent newspaper here reported recently that Goggin is not living only on his pension, gigantic though that is. He has a new lease of life as the front man here for the New York-based private equity group Apollo which, among other things, specializes in buying up distressed property loans and has its eye on making a buck out of the property and banking crash in Ireland. This is a long game which involves buying the loans at a big discount and then hanging in there for a few years until the property market recovers. If it works out Goggin will make a bundle out of the mess he helped to create in the first place. What a guy! Maybe then he won't have to bother with his pension? But don't hold your breath.